If you believe everything you read in the media, you could be excused for thinking the U.K.-based online real estate agency Purplebricks is a company in crisis. The stock price is significantly down from the highs of last year, the U.S. and U.K. CEOs are out, and revenue guidance has been repeatedly downgraded. Purplebricks faced a rocky international expansion, especially in the U.S. In a span of nine months, it quietly raised prices, completely pivoted its fee model, and then parted ways with its U.S. chief executive. During the same period, it lowered future revenue expectations not once but twice, down from total group revenues of £185 million to £140 million. But like all irrational systems, the stock market trades not only on reality, but the perception of reality. While Purplebricks' stock has faced a turbulent three years, its underlying revenue has consistently grown by impressive margins. The sharp rise in 2017 was driven by unrealistic optimism for international expansion, on the back of 100% growth in the U.K. In 2018 it was clear international markets were a tough nut to crack, while U.K growth slowed considerably. Still strong in the U.K.
As I wrote in July 2018, Purplebricks' U.K. business model works, it makes money, and -- at scale -- is profitable. It's a mistake to confuse Purplebricks' stock price with its overall success. The only challenge facing the U.K. business is growth, which is clearly slowing down as the company saturates the market. All online agents are not doomed to failure because of some fundamental flaw. Market share can only get so high. In November 2018 I was quoted in the Financial Times saying, "I rolled my eyes when analysts were talking about 20, 25 per cent market share [for digital leaders]." And it's true. Depending on the source, Purplebricks' U.K. market share is anywhere from 3.2 to 4.5 percent. What's the problem in the U.S.? The U.S challenge is simple: Purplebricks' massive marketing spend is not generating enough customers. The company recently pivoted its business model in the U.S., from an up-front fixed fee (paid regardless of the home selling), to a success fee paid only when a home sells -- both at a discount. This move brings Purplebricks squarely in line with the traditional industry it was attempting to disrupt. The proposition is now also identical to Redfin. In December of 2018, I estimated Purplebricks generated between 1,200 and 1,400 new listings over the preceding six month period. During that same time, Redfin reported around 22,000 closed transactions. Also during that period of time, Purplebricks spent over $20 million in marketing, compared to Redfin's $16 million. The result is a customer acquisition cost of $15,000 for Purplebricks, compared to $730 for Redfin. Purplebricks is still dangerous: it has deep pockets, a willingness to spend, and the self-awareness to pivot when things aren't working. I wouldn't count them out of the U.S. quite yet. The biggest implication, however, could be the massive amount of money being spent on marketing by disruptive players (over $100 million between Purplebricks and Redfin alone in 2019). And what's the message of that marketing? Traditional agents are expensive, we offer the same service at a discount, use us instead. Expand the scope to iBuyers like Opendoor and Zillow and the tens-of-millions they are spending on marketing. What's the message? Traditional sales are complicated and confusing, use us instead. Disruptive companies are spending hundreds-of-millions of dollars on TV commercials, radio ads, and online advertising that hammers home a clear message to consumers: a credible alternative to traditional real estate. Now, more than ever before, consumers are being bombarded with advertising offering them a choice. The industry may not change overnight, but consumers will be asking more and more questions. How many international media conglomerates -- that own a number of leading real estate portals worldwide -- have “hybrid agents” as one of its top strategic priorities? Just one: Axel Springer. Why it matters: Axel Springer, the $6 billion European media house, is going "all in" with online hybrid agents, through its investments in Purplebricks and Homeday. It's making a calculated bet that competing with its real estate agency customers is the best long-term strategy. Dozens of the largest real estate portals around the world are owned by a small collection of international media companies: News Corp, Schibsted, Naspers, and Axel Springer. But of them all, only Axel Springer has taken the step of investing in a potential sector disruptor: the online hybrid agent. Axel Springer owns major real estate portals in France, Germany, Belgium, and Israel. In March 2018, it made a bold, £125 million investment in Purplebricks. The investment is notable because Axel Springer owns several top portals whose customers are the same real estate agents that Purplebricks is trying to disrupt (albeit in different markets). 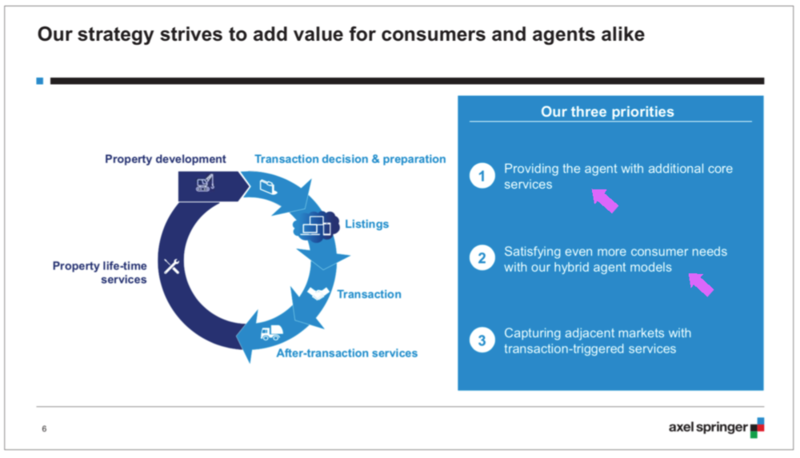 Axel Springer's strategy offers a fascinating juxtaposition: Adding value to traditional agents by providing more services (seller leads), while "satisfying even more consumer needs" with its hybrid agents -- which directly compete with traditional agents. Continuing to serve your customers while entering into direct competition with them is a delicate balancing act. It's a move reminiscent of Amazon promoting its own products in direct competition with many of its sellers. This is the nightmare scenario that U.S. real estate agents have been predicting for years. But in this instance it's not Zillow, but one of Europe's most powerful players, taking active steps to disrupt agents. It's been clearly illustrated in the U.K. market that the online agent space is winner take most (market share). Access to capital is the single biggest predictor of success. There is no first mover advantage in these markets (Purplebricks was not the U.K.'s first online hybrid agent). Rather, there is a rich first mover advantage: the business with the deepest pockets generally wins. In this regard, Axel Springer and Purplebricks form a powerful combination. From a competitive standpoint, the most dangerous thing about Purplebricks is its investment risk tolerance. It is willing to invest tens-of-millions of dollars year after year to build market share -- incurring big losses along the way. And with Axel Springer and its deep pockets along for the journey, it's a hard combination to beat. Axel Springer and Purplebricks are quickly building a potentially insurmountable lead in the online hybrid agent space globally. There is no runner-up in the sector; it's a one horse race. Purplebricks has proven the online hybrid model works in the U.K., and is aggressively launching in other markets. Copycats are popping up around the world. What's stopping News Corp, Schibsted, and Naspers from entering the space? It's either capital, ambition, or fear of upsetting their agent customers. There is undeniable momentum in this direction. While not every portal is seeing success, the shift is clear -- and unyielding. Axel Springer's bet on online hybrid agents, in direct competition with its real estate agent customers, is the latest example of this evolving strategy. It was my pleasure to present at the invite-only Proptech CEO Summit in San Francisco, hosted by former Trulia execs and current venture capitalists, Paul Levine and Pete Flint. There were over 100 proptech CEOs present, including Glenn from Redfin, Eric from Opendoor, and many others. I want to share my entire presentation from the event, in addition to highlighting a few key points. The first point deals with the critical role of human psychology in real estate transactions, and the concept of loss aversion (for more, check out How Psychology is Holding Back Real Estate Tech). Human psychology is the single biggest obstacle to mainstream adoption of new technologies in real estate. The point I made in my presentation is this: every venture capitalist should be asking proptech start-ups how they are going to address loss aversion. And the inverse is true: each startup should clearly explain how its product or service is designed to minimize loss aversion in consumers. Building the technology alone is not enough. Real estate tech companies need to assure consumers their product is just as "safe" as the status quo. PropPsych is just as important as PropTech. The second point relates to the massive amounts of money flowing into the ecosystem. To quote Glenn Kelman, "If we can afford to lose money for five years, how can we ever make money?" The biggest players in the space -- Opendoor, Purplebricks, and Compass -- have raised hundreds of millions to over a billion dollars each. The next tier of start-ups have raised tens of millions of dollars each. But none of these companies are actually doing something new; they're doing what's possible with massive amounts of capital. Yes, there are novel aspects of the business models that allow these business to realize gains in efficiency, or provide a superior customer experience. But all are underpinned by massive amounts of capital. The reason that Compass can buy market share, Purplebricks can generate tons of leads through advertising, and Opendoor can buy thousands of homes is access to vast amounts of capital. Attached below is a link to my presentation on Slideshare (you can also download the PDF). Unlike my numerous industry reports, this is designed to be delivered in person. But hopefully it helps you and your business. Last week, Purplebricks released its half-year financial results. The top line results include an overall group loss of £27.3 million for the period, with a slight reduction of its full-year revenue guidance. But the top line numbers don't come close to telling the full story (hint: it's not as bad as it sounds). Why it matters: Purplebricks' core U.K. market continues to grow and is meaningfully profitable, proving that the model works. Key performance indicators in its other three markets reveal a deeper story of investment, growth, and challenges. Continued growth in the U.K. The popular narrative is seductive, but factually incorrect: With massive losses at Purplebricks and the demise of online agent Emoov (which, by the way, was not the second largest online agent in the U.K.), the entire online agency business model is near collapse. Not quite. Purplebricks is an international collection of businesses at various stages of growth. In the U.K., Purplebricks' most mature market, it continues to grow revenues and operating profit. At maturity and scale the business model absolutely works; there is no evidence to support otherwise. Yes, growth is slowing in the U.K. But at nearly 80,000 instructions per year it can't be expected to keep growing at historic rates. The key is that even in a challenging economic climate, growth continues. While progress in the U.K. is consistent and positive, Purplebricks' Australian operation has endured a turbulent year. Senior management changes, a business model pivot, and its fair share of negative press has resulted in a "bump in the road" over the last six months. Revenue growth is up year-on-year, but down from the previous six months, with a corresponding hit in operating profit. One data point does not make a trend, so all eyes are on the next six months as Purplebricks executes its Australian turnaround plan with a new team and new pricing strategy. Purplebricks continues to invest heavily in its U.S. rollout. Over the past six months, it has spent over $20 million on sales and marketing across seven States -- more than double what it spent last year. Purplebricks managed between 1,200 and 1,400 instructions in the U.S. over the past half-year, or around 200-230 per month. The cost per instruction has dropped from around $21,000 to between $14,000 and $17,000 (each instruction is worth $5,205 in revenue to Purplebricks). At the current rate, Purplebricks will need to go from 200 to 650 instructions per month to reach breakeven with its sales and marketing costs, and to 1,000 instructions per month to reach profitability. To achieve profitability, Purplebricks will need to get all of its launch markets performing well, not just L.A. One example is the lackluster performance in Phoenix, as I wrote about last week. At its core, Purplebricks is as much an advertising company as it is a real estate company. The business model relies on a massive marketing expenditure to generate leads for its network of agents. Thus, one of the most important metrics for the business is marketing efficiency. For every £1 spent on marketing, Purplebricks generates revenues of £3.60 in the U.K., £0.92 in Australia, £0.36 in the U.S., and £4.38 in Canada (Purplebricks' Canadian acquisition was a fantastic deal). The core Purplebricks business model -- and profitability at scale -- is sound. The market failure of smaller players, or the fact that Purplebricks is deeply investing in new markets, doesn't diminish that fact. From a competitive standpoint, the most dangerous thing about Purplebricks is its investment risk tolerance. It is willing to invest tens-of-millions of dollars year after year to build market share -- incurring big losses along the way. If you're a traditional real estate agency, or a listed company, are you willing to do the same?